I have been part of a group of people who were selected to test Apple's move into the consumer appliances market. While being under NDA has been difficult, it officially ended Mar 31, 2009 and I can now share the results (and where you can order one - below). It makes sense for Apple to move in this direction, after all - they have dominated the phone and TV market places. Moving to Microwaves, Fridges and Stoves is a logical next move for the consumer electronics giant, joining companies like Sony, General Electric, Siemens and others. If Apple's past reputation is anything of an indicator, I think they will be a serious threat in this marketplace. My experience was very good. 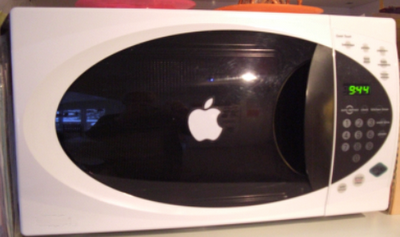 I was selected to preview the new Apple Microwave. Let me tell you - this is no ordinary appliance. Apple has integrated components from their computer platform such as Bluetooth, network access, pinhole cameras and a range of other sensors. The Apple Microwave is so easily integrated with their other products, you can actually use it with your iPhone (as long as you're within Bluetooth range). 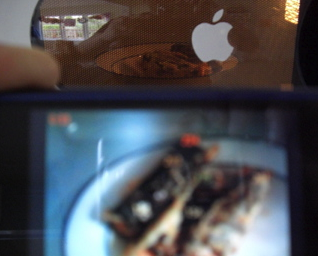 The Apple microwave has a small pinhole camera which transmits images on Bluetooth. These can be picked up with a standard iPhone or iPod as well as any Mac laptop that is Bluetooth enabled. The Microwave also has sensors that probe the surface temperature of the dish you are cooking and even track it as the food turns on the turnstyle. The images are overlayered with temperature readings. - In Canada (and most of the rest of the world) we use Celsius. The current model I tested only had Fahrenheit. I am sure this will be fixed in the next release. See image below. The number in the top left-hand corner is the timer showing 33 seconds left. - There is a delay in transmitting images to the iPhone (I haven't tested any other BT device). 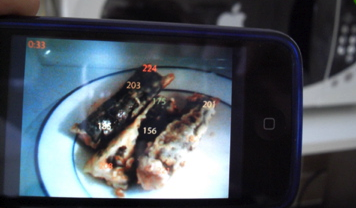 Note that in the photo below, the rotation of the food shown on the iPhone is about 2.5 seconds behind the rotation of the food on the turnstyle. The rotation in this case is going clockwise. - I would also like to see network connectivity to monitor thawing food from other rooms in my house. I love it. I haven't been asked to give it back yet and I would not want to. Apple is supposed to open up their beta program later this week. Keep your eye on the following URL where you will be able to apply. I am not sure how much the final consumer pricing will be.